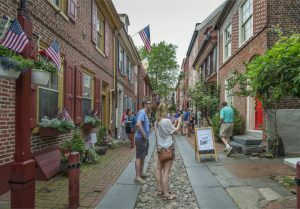 Elfreth’s Alley was once home to a small community of artisans. 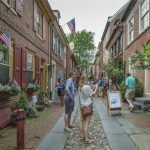 This short and narrow alley between Front and Second Streets in the Old City neighborhood was not part of William Penn’s original layout of the city. In the early eighteenth century most of Philadelphia’s population was living and working within four blocks of the Delaware River. As the population grew, so did the need for more residential space, and small connector alleys like Elfreth’s were built to accommodate easy movement. Proximity to the waterfront trade drew artisans to Elfreth’s Alley shortly after its construction in 1706. Often they used the front rooms of the first floor of their homes as workshops and the rest of the home as private living space. This configuration was recreated in the Elfreth’s Alley Museum House. In the wake of the Seven Years’ War, Britain expanded its control of its North American colonies by passing a number of Acts of Parliament directly impacting colonial residents. The first of these was the 1765 Stamp Act. It was the first direct tax on the colonies and required colonists to purchase special paper for legal and business transactions. Colonists fought back with “nonimportation” and “nonconsumption” of British goods, the first major boycotts in history. These boycott agreements proved a boon to the city’s artisans, whose home-produced goods increased in popularity. 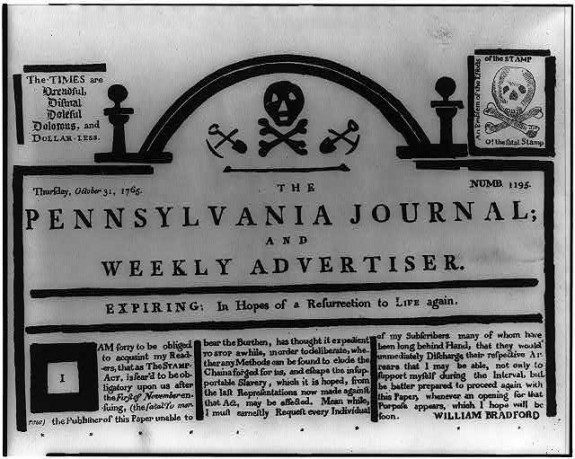 This October 1765 issue of the Pennsylvania Journal and Weekly Advertiser published just prior to the tax taking effect parodies the required stamp with a skull and crossbones. The act was repealed within a year. Later Acts of Parliament like the 1767 Townshend Acts had the same effect of increasing consumption of home-produced goods and unintentionally helping Philadelphia’s artisans. The popularity of artisanal goods waned after the Revolution when international trade resumed and inexpensive British goods were imported in large quantities. One of the city’s more storied historic buildings was originally constructed to house an artisan’s guild. The Carpenters’ Company was organized in Philadelphia in 1724 for the benefit of the area’s craftsmen, providing an education and support network. Many founding members were alumni of London’s Worshipful Company of Carpenters and modeled their new guild after it. 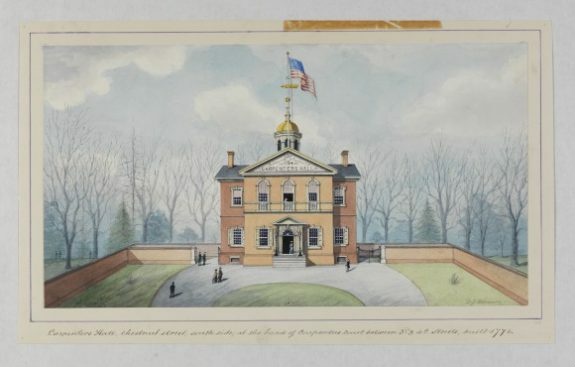 They began construction of their headquarters, Carpenters’ Hall, on Chestnut Street near Third Street in 1770. 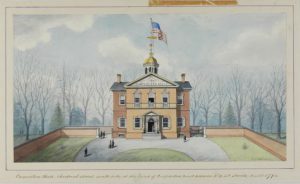 Months after the building was completed in 1774, it housed the First Continental Congress, a meeting of delegates from twelve of the colonies early in the Revolutionary era. The next year, Benjamin Franklin conducted secret meetings with French spy Julien Achard de Bonvouloir to secure French aid during the war. Today the hall is still owned by the Carpenters’ Company, the oldest extant trade guild in the nation. Members of the company have been involved in the construction of some of Philadelphia’s most iconic public buildings, including Independence Hall, City Hall, and Reading Terminal Market. Becoming a master artisan was a long and difficult process that started early in a boy’s life. After a few years of training, a boy in his early teens would be sent out on an apprenticeship to an established artisan. This artisan would charge the boy’s family a fee for room, board, and education, which varied with the specific trade. More skilled trades like silversmithing commanded a higher price, while an apprenticeship in shoemaking was usually more affordable. Apprentices began by performing the most basic tasks like sweeping floors, but would begin a formal education in the trade after a period of learning by observation. On completion of an apprenticeship, which took about seven years, he set out on his own as a journeyman. Journeymen hired themselves out to shops for wages until they completed a masterpiece that showed an extremely high skill level in their trade. As master artisans, they could then open their own shops and employ their own apprentices and journeymen. This system changed radically after the American Revolution. Apprentices no longer learned the skills of their trade, but instead were considered wage workers. Journeymen accustomed to frequent breaks and a casual work pace with little oversight lost much of their autonomy. Tensions between journeymen and master artisans over labor practices and wages increased into the nineteenth century and led to some of the nation’s first unions and labor strikes. Benjamin Franklin got his start as an apprentice in his father’s shop at the age of ten, making candles and soap. 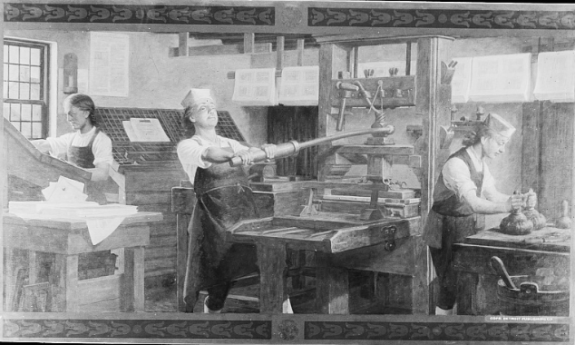 He found the trade not to be to his liking and was eventually apprenticed to an older brother, James, in his Massachusetts print shop. Both brothers agreed only reluctantly, James believing that Benjamin was too old to begin his apprenticeship and Benjamin preferring to go to sea. 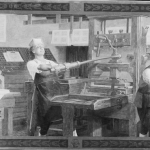 When James’s newspaper printed contentious articles that landed him in political hot water, he evasively ended Benjamin’s contract and declared him to be the new editor. Now free from his apprenticeship, Benjamin fled to Philadelphia to begin his own work. He was hired out as a journeyman despite never finishing his apprenticeship. 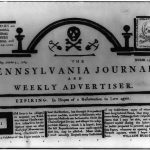 By the age of thirty, he had become a master printer and in 1729, seven years after his arrival in Philadelphia, he took control of the Pennsylvania Gazette. 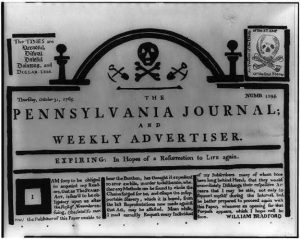 The paper grew to be one of the most successful periodicals in colonial America. 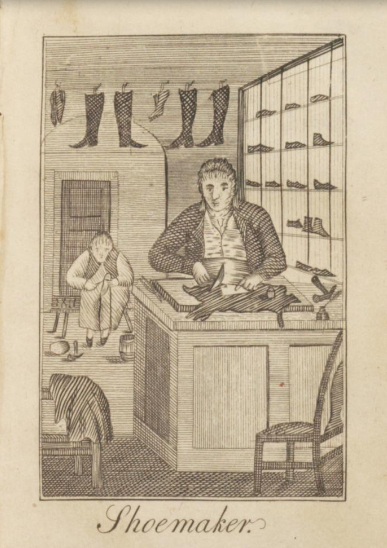 As skilled laborers who hand-crafted their goods on a per-customer basis, artisans played a central role in the formation of Philadelphia’s prerevolutionary economy: producing essential goods and services and providing social stability within households composed not just of immediate family but also of journeymen and apprentices. American independence brought artisans new economic opportunities as the city expanded and new markets emerged. With the maturing of a market economy, however, artisans, and journeymen in particular, faced the loss of both social and economic status as the economy that supported such work became more volatile and contentious. During the early colonial period, up until the mid-1760s, the town economy of Philadelphia built on the contributions of artisans and entrepreneurs. Artisan shops produced shoes, soap, wagons, clothes and food for the town, while also laying bricks and constructing buildings. By 1745, master artisans made up 48 percent of the total population of Philadelphia, highlighting their significance to the burgeoning town. For artisans of this period, the home and workshop were very often in the same building or at the least in close proximity. In some cases, master artisans labored alone to complete specific orders for their customers, but in many cases they relied on the work of indentured servants, slaves, and a few skilled journeymen to assist in the completion of their tasks. Master artisans were respected throughout the city, due in large part to the vital goods they provided the community, but also for the independence of their craft. By the end of the Seven Years’ War (1754-63) the labor market had changed dramatically to favor free laborers over indentured servants, whose availability had declined. Typically, then, master artisans owned the shop, ordered supplies, supervised the workers, and continued to work alongside his employees, including apprentices and journeymen. Apprentices were traditionally teenagers who spent three to seven years learning their craft under their masters, from whom they could expect room, board, and education. Between the ages of eighteen and twenty-one they would be promoted to journeymen status, given a set of tools, a suit, and a wage. Journeymen were skilled workers who performed their work with little interference from the master and received pay by the day or by piece. Tradesmen viewed this system of labor as a type of fluid hierarchy in which apprentices would someday climb the artisanal ladder, from journeymen to master and proprietor of their own shops. The relationship between master artisans, journeyman, and apprentices was initially built on mutual respect, and master artisans took a paternal role over their laborers. Work was performed at a casual pace and on a per customer basis. Workers wore leather aprons, shared workbenches, and worked with hand tools to construct their goods. The workday was long, traditionally twelve to fourteen hours, but consisted of morning breaks for coffee and beer, a lunch break in the early afternoon, and a late afternoon break for a snack. Overall, artisans within Philadelphia strove for “competence,” the ability to provide enough money to support their families and save a little for the future, but few master artisans were actually able to reach this level of economic comfort. The end of the Seven Years’ War also brought implementation of imperial acts by Britain on the colonies. These acts served as a blessing for many struggling Philadelphia artisans because many of them did not tax home-produced goods. As Philadelphians used the policies of nonimportation, or the boycotting of British goods, in the years leading up to the American Revolution, the purchase of home-produced goods brought increased business to Philadelphia artisans. Nonimportation pitted artisans against merchants who benefited from Atlantic trade with Britain, but these differences were largely cast aside once war broke out. During the War for Independence, Philadelphia artisans enjoyed a period of production with little competition. This did not last long, for when the war ended and Atlantic trading resumed, artisans found themselves once again competing against foreign goods. During the postrevolutionary years, they joined merchants in seeking a stronger central government that would protect the nation’s domestic industries. The postrevolutionary years also brought dramatic shifts to the relationship between master artisans, journeymen, and apprentices. By the 1780s masters no longer signed contracts with apprentices promising tools, clothes, or an education, but instead replaced these items with monetary compensation. Masters refrained from teaching apprentices the art of the craft and instead tended to rely on them as simple wage laborers. The increased presence of under-trained workers within their craft angered many journeymen, as did other changes within their labor environment. As work customs changed to meet new market obligations, such as fewer breaks, more oversight, less autonomy at work, and decreased wages, journeymen perceived their interests diverging from that of their masters, and they began to doubt their ability to climb the artisanal ladder. Such changes strained the relationship between masters and journeymen. Perceiving master artisans as no longer producing for a community, fulfilling their paternal obligations, or striving to reach “competence,” journeymen came to view their master’s intentions as a threat to the social and economic order of society and at odds with the true and moral intentions of labor. The first sign of dissension emerged in 1786 during one of the nation’s first strikes—the first recorded strike in Philadelphia’s history—as journeymen printers went on strike against employers refusing to pay a weekly rate of six dollars. Further divisions became apparent during the 1788 Federal Procession, which honored the ratification of the U.S. Constitution, when at least two trades marched in separate companies, one of master artisans and one of journeymen. By the 1790s early labor disputes between these two groups sprung up in a number of crafts, including carpenters in 1791 and cabinetmakers in 1795. Tensions between these two groups continued after the turn of the century as revolutions in transportation, communication, and industrialization greatly expanded the market economy well beyond Philadelphia, giving priority, in the eyes of journeymen, to the market over the moral intentions of craft labor. While artisans played a significant role in crafting Philadelphia’s colonial and pre-Revolutionary economic and social history, divisiveness within artisanal ranks also played a large role in shaping Philadelphia’s post-Revolutionary history. As markets continued to expand throughout the first half of the nineteenth century, the divide between master artisans and journeymen grew. Many master artisans left the workshop and became simply business owners, merchants, and entrepreneurs. Journeymen continued to toil in the workplace, but it was as wage laborers, and work was most likely performed at a machine and no longer at a workbench. As friction between these two developed into the 1820s journeymen laborers responded with the formation of trades unions and political parties to fight their cause, which set up a nearly thirty-year period of labor and class unrest within Philadelphia. Patrick Grubbs is a Ph.D. candidate at Lehigh University who is writing his dissertation entitled “The Duty of the State: Policing the State of Pennsylvania from the Coal and Iron Police to the Establishment of the Pennsylvania State Police Force, 1866 – 1905.” He has been employed at Northampton Community College in Bethlehem, Pennsylvania, since 2009 and has taught Pennsylvania history there since 2011. Bernstein, Leonard. “The Working People of Philadelphia from Colonial Times to the General Strike of 1835.” Pennsylvania Magazine of History and Biography, Vol. 74, No.3 (July 1950): 322-39. Caric, Ric Northrup. “’To Drown the Ills That Discompose the Mind’: Care, Leisure, and Identity Among Philadelphia Artisans and Workers, 1785 – 1840.” Pennsylvania History: A Journal of Mid-Atlantic Studies, Vol. 64, No. 4 (Autumn 1997): 465-89. Klepp, Susan. “Demography in Early Philadelphia, 1690 – 1860.” Proceedings of the American Philosophical Society, Vol. 133, No. 2, Symposium on the Demographic History of the Philadelphia Region, 1600 – 1860 (June 1989): 85-111. Olton, Charles. 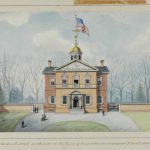 Artisans of Independence: Philadelphia Mechanics and the American Revolution. New York: Syracuse University Press, 1975. Salinger, Sharon V. “Artisans, Journeymen, and the Transformation of Labor in Late Eighteenth-Century Philadelphia.” The William and Mary Quarterly, Vol. 40, No. 1 (January 1983): 62-84. Schultz, Ronald. 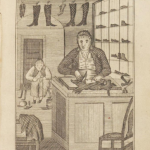 The Republic of Labor: Philadelphia Artisans and the Politics of Class, 1720 – 1830. New York: Oxford University Press, 1993. Schultz, Ronald. “The Small-Producer Tradition and the Moral Origins of Artisan Radicalism in Philadelphia, 1720 – 1810.” Past & Present, No. 127 (May 1990): 84-116. Franklin’s Print Shop, 320 Market Street, Philadelphia. Thank you for this essay on artisans in early Philadelphia. We forget that in the 18th century every article of clothing you wore, every stick of furniture you sat on and every tool you used was mostly hand made by an artisan. One observation, however. The word “journeyman” and comments like “becoming a master artisan was a long and difficult process that started early in a boy’s life,”can ignore the role that female artisans played in the city’s economic life. For instance, Mary Smith and Sarah Milton, the women who lived in what is now the museum house on Elfreth’s Alley, were skilled mantua makers, who employed apprentices of their own. A few years after them, there were also two female shoemakers living and working on the Alley. Finally, the most iconic female artisan in Philadelphia was, of course, Betsy Griscom Ross, who was apprenticed to an upholsterer for several years, before opening her own business with her husband and fellow apprentice, John Ross.